Drive-by history. 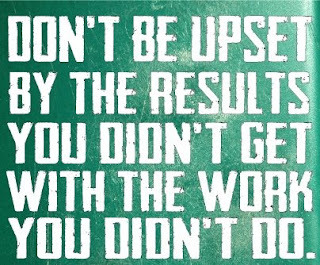 It’s a shame but what else can you do? Hold that thought for a moment and look at the art above. It's the start-to-finish animation of LtCmdr. John Waldron's TBD-1 Devastator circa the Battle of Midway, June 4, 1942. It's a rare airplane for me in that I was unable to talk to her pilot. As for real-life examples to use as reference, the only surviving TBDs left are dissolving on the ocean floor. See, this airplane was Waldron's pyre. The ocean, his grave. 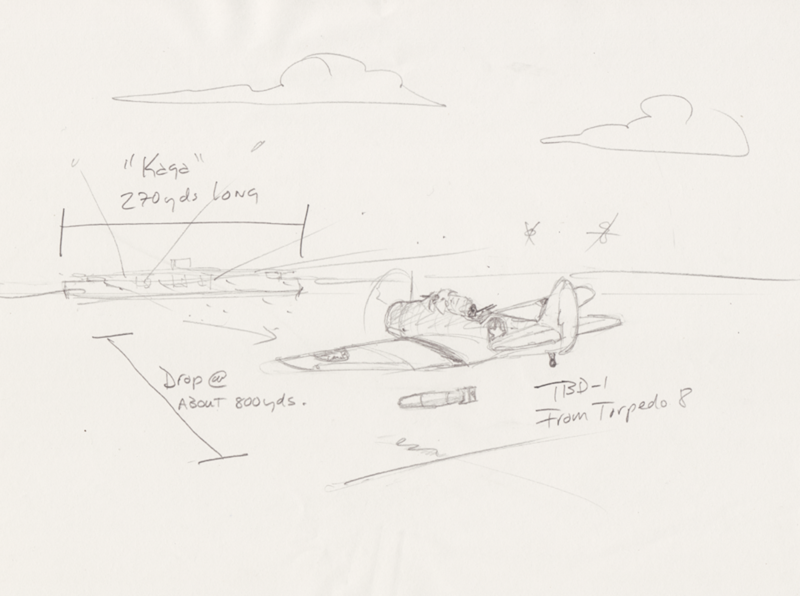 It's not easy drawing a dead man's airplane, especially one that was cut down so tragically; Waldron lead his squadron, Torpedo 8, on a valiant charge against the Japanese carrier Kaga (or was it Soryu?) during the opening rounds of the battle. 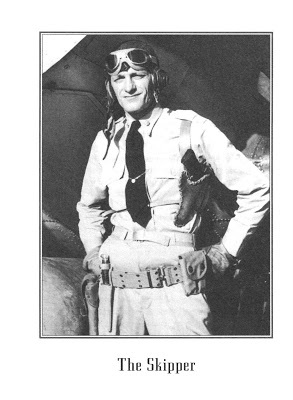 It was the squadron’s first time in combat, first time with live torpedoes…I figure within five minutes of making their bomb runs, they were all downed—the entire squadron of 15 airplanes, 29 men, gone. 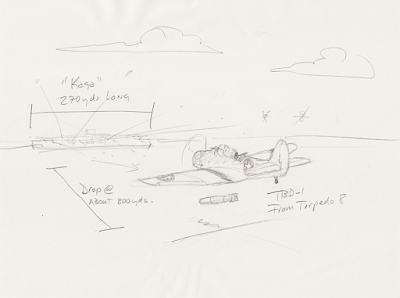 Among history geeks, "The Story of Torpedo 8" is well known. It has every element of the classic tragic tale—valiance, naivety, incompetence, duty, valor, foolishness… Even today, on the cusp of the 21st Century, the story can bring a man to tears. I know this because the man who commissioned my artwork did just that. I made this little doodle to get an idea of what was going on when Torpedo 8 attacked Kaga (or the Soryu, or the Hiryu...). 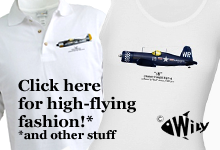 It doesn't show any other Japanese ships or the defending Japanese Zero fighters. John Waldron's Navy Cross. My journal. Stuff like this makes my day. Of course, there are real books written about the Battle of Midway. Heck, it's such an incredible moment of American history, my dad wrote his ROTC Officer's Thesis on it and he was Army! But in the end, the Battle of Midway was simply the beginning of the end for the Japanese. They were crushed. So why the tragedy for Torpedo 8? Firstly, the Battle of Midway was still on the left-end of the learning curve for naval aviation. The war in the Pacific was barely seven months old and Midway marked only the second time America's carrier-based aircraft would be used in full-scale warfare. Attack procedures, tactics and equipment were more based on theory than practice. This is, of course, is the reality of things and proof of the adage, "No plan survives the first 30 seconds of combat." Secondly, the TBD Devastator was obsolete. Five years prior it was state-of-the-art. By 1942, tech had surpassed the poor bird's standard. Loaded for combat, the airplane could barely crack 95 miles per hour. That's fast on the interstate but against 300mph enemy fighters and a blizzard of ship-fired anti-aircraft guns, 95mph was practically stationary. Thirdly, the TBD was poorly kitted for combat. The .30 caliber nose gun might have been fine for deer hunting but firing it against something like an armored warship was not even annoying, let alone deadly. The rear gunner was also armed with a single .30. Against the thin-skinned Japanese fighters, the odds increased but not by much. To this end, Waldron insisted on fitting Torpedo 8's TBDs with an extra .30 machine gun, doubling the defensive power (bear in mind, the British put FOUR .30 caliber guns in their turrets, but let's not go there right now). 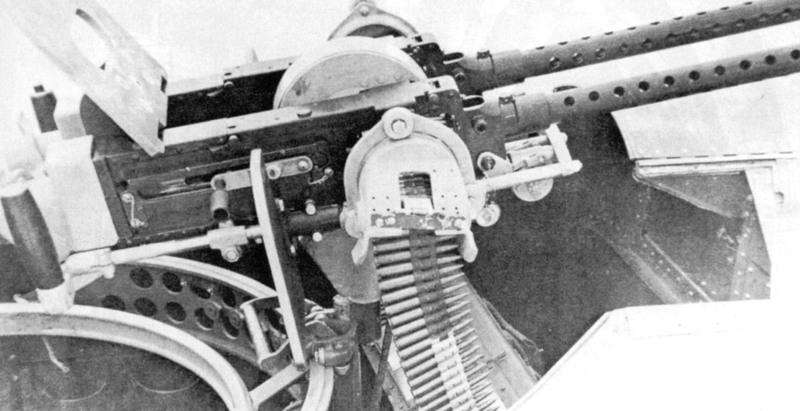 This photo (credit unknown) is supposedly a shot of Waldron's double-.30 gun modification. Better that the original single-gun mount but in reality, nowhere near good enough. Fourth, Torpedo 8 was ridiculously managed. Now, I wasn't there. But according to Robert Mrazek's excellent book, "A Dawn Like Thunder" the Air Group from the USS Hornet (1 fighter squadron, two dive bomber squadrons and one torpedo squadron) was poorly lead. Instead of giving the slow, poorly defended TBDs fighter protection, the battle order placed the fighters high above the wave-riding TBDs. To get your head around how weird putting all the fighters "on-top" was, the next time you fly commercial, listen for when the flight attendant announces that you, "...can now use portable electronic..." When that happens, you're around 10,000 feet. Look out the window and watch the ground. Imagine down there, a squadron of tiny lumbering torpedo planes chugging along. Now, double your altitude to 20,000 feet. Now imagine what happens if you're in charge of protecting them—the enemy could make two, three passes by the time you can make any difference at all! I have no idea what "they" were thinking. Neither did Waldron. Reportedly he asked numerous times for fighter cover. Three maybe only two F4F Wildcat fighters would have been enough. But no, the TBDs of Torpedo 8 got nothing. Lastly, however, is the factor that remains somewhat controversial as it involves Waldron's disobeying command. Some how, some way, Waldron had an issue with the course that the Air Group was to take in order to find and attack the Japanese fleet. Putting a metaphysical point on it, Waldron's instincts told him that the attack force was heading the wrong direction. Some how, some way, he knew where the Japs were. After requesting a course correction twice (and being denied), Waldron pulled Torpedo 8 out of the formation and led them on, alone. Who knows if, had Waldron been given a covering group of fighters, if they would have followed suit. It doesn't matter. The Hornet's attack force never found the Japanese fleet, wasting the battle resources. I bought the August 31, 1942 edition of LIFE magazine. This is the spread they gave Torpedo 8. The little TBD models are ones I bought to use as references. Waldron is marked by the red arrow and George Gay, the only survivor the Hornet's TBD force, is circled. 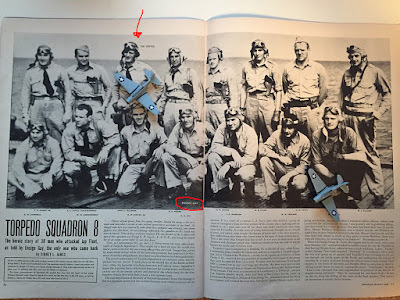 Before you think Waldron was really just a mutineer, recognize this—while Torpedo 8 was getting cut down by Japanese fighters, dive bombers from the USS Enterprise were able to sneak in and crush the Japanese carriers, effectively ending any hope for Japanese victory. Period. In the end, the Japanese lost four aircraft carriers to the American's loss of one. Waldron's instinct led he and his squadron to death, but in the end, it became the key to American victory in the Pacific. This afternoon, I had lunch with a doctor that practices medicine in another country. He’s been doing it for years; it’s his passion to serve the people and do what he can to raise the standard of medical care there. Evidently, this country used to provide free medical care to its people but are now loosening the controls to the point where the average citizen is paying for his/her own care. Same with education, too. A government-paid University degree is becoming a thing of the past. I found this on the inter webs. It seems to make a certain sense. Hmm. Now, this is not a political rant. This is a post about a WWII airplane and her pilot. It doesn’t take too long to learn some remarkable facts on Waldron. For one, he had Native American blood. His mother and grandmother were Native Americans and he spent time on at least two Indian Reservations. For two, he was a South Dakotan. You can’t get any further from the ocean than South Dakota. That he ended up a Naval Academy graduate is even more ironic. For three, he was 41 years old when he died, a veritable old man that should have been back at the carrier with a cup of coffee. For four, he was a husband and father with everything to live for. I can state with utter confidence that Waldron did not have a death wish. Instead, he was driven by principles and values that somehow, someway transcended the notion of safety. And, these were the kind of principles and values that led every other member of Torpedo 8 into their machines. In fact, I’d say that Waldron’s story is no different than anyone's who is willing to risk something dear for something greater. Of course, this kind of thing is hard-wired into our military, law enforcement, first-responders, doctors…but what about other kinds of venture like business, human rights or (gasp) politics? 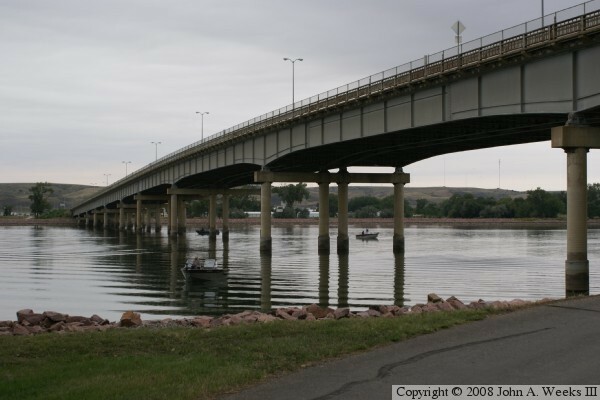 Right now, there’s a plaque at the foot of the John C. Waldron bridge that crosses the Missouri river between Waldron’s birthplace of Fort Pierre and the state capitol of Pierre. It was put up in 2002 and I’ll be damned, I just found out about it last week. Photo from JohnWeeks.com I drive across this bridge 4-5x a year and never knew it was named after a bona fide hero. Riveted to a slab of rock, it’s a fine plaque but it’s simply another piece of drive-by history; “names, dates and places” with a few dramatic words sprinkled in. Of course, there’s no problem with the placard in and of itself. The problem really lies in that this is it. So, please have another look at the drawing—the pencil-sketch genesis to its finished form. I was paid to do it, but in exchange for money, I put in nearly 60 hours and involved at least a dozen people around the world (fact checkers, detail wonks, history geeks). There was nothing “free” about this drawing; its quality is the result of many coming together for an idea that John C. Waldron’s service symbolizes something worth keeping alive. Everything worthwhile has a price. And if we want to truly own it, we need to pay for it. I suspect that’s what Waldron would say to Buddy Macon. I suspect that’s what Waldron would want on his plaque, too. I even suspect that Waldron would approve of the advances made by the country that my doctor-friend serves. But for me, I’d like to see this in the classroom. Thank you for the example, John C. Waldron. *The Mk.13 torpedo often had multiple defects like having dead motors, sinking to the bottom, turning in circles instead of going straight, running too deep and simply not detonating. Today, there'd be a headline and a trial. Back then, however, it was understood as part of the process. Go figure. **I have no issue with whatever Bruce/Caitlyn Jenner wants to be. My problem is that somehow, this year, he became news, displacing things of greater consequence. Profile 112: JUST STARTED—QT-2PC as flown by...who?! A call came in, an unknown phone number from Texas; I answer and someone drawls, "Yuh'interested in a storah?" Anyone else might hang up. Or at least say, "Pardon me?" But I know better, especially if there's a Texas accent attached to it. So, I sat down on the front step and readied for the moment. "Storah?" I replied. "It bettah' be a good'n!" Have a look at my sketch above. It's one of the coolest looking warbirds EVAR and chances are good, you have no clue what it is (because I didn't either until my Texas Buddy explained it). 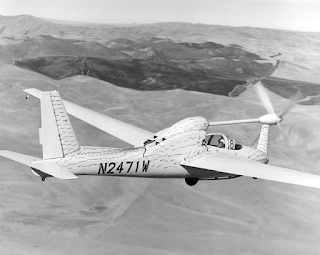 It's the QT-2PC, one of only two of the type that flew during the Vietnam War. It's role was to loiter over combat areas and spot Viet Cong traffic at night. Built around the excellent Schweitzer 2-32 glider, this powered version was, in many ways, an ancestor to today's drone. Photo of the QT-2PC's godfather, the QT-2 (prototype). Now, here's where things get a little...strange. At the time, there were no markings other than a giant numeral on the tail and those that built it refer to its military sponsor as a "Customer" rather than a specific branch or unit. As a fact, the Army claimed ownership but the project team was actually tri-service (Army, Navy, Air Force). However, the overriding project was actually managed by DARPA - the Defense Advanced Research Projects Agency. DARPA, though sometimes clouded in mystery (some truth to that) was created in 1958 as an R & D lab to develop new technologies for military use. Basically, if the Air Force ever got jet packs, the Navy flying subs, the Marines computerized body armor or the Army "smart" bullet, DARPA prolly done'it first. In 1967, with the war in Vietnam all hot and heavy, DARPA got wind of a Navy pilot's idea for a low-altitude observation plane that could fly for long periods of time and be undetectable via sight or sound. At the project onset, we were LAC’s LMSC Advanced Concepts Airborne Systems Quiet Thruster Program working in a secure corner of the Lockheed Aircraft Service Executive Transport Service Hanger in San Jose (really different and almost independent from the main plant – Skunk Works, North. We were known in the “White World” as “San Jose Geophysical” and we answered the phone with “Stan’s Cleaning and Pressing”. We did not become Prize Crew ‘til late in the year – after we overwhelmed the competition in an acoustic “fly-off” competition. At that time (approx end of Sept), our onsite DARPA (to say the least) recommended the experimental aircraft converted to tactical versions (in 90 days), sent to and evaluated in Vietnam (The Prize Crew Operational Evaluation (OpEval). I know of two specific sites/reasons for the deployment, but don’t which is correct. Whatever, DARPA could not field the project, so the Army Transportation Corps did so. And, because they were paying the bills, we ended up in “Target Rich” IV Corp (IV CTZ)! Make sense? Sure it does. And if I have any say in the matter, it'll make even more sense the next post! But until then, let me explain the phrase, "Prize Crew". A progress shot. The color is bizarre; its very apparent that it was a custom job and not part of any prescribed formula. I'll be adding quite a bit of gray, white, yellow and blue to help match the handful of decent color shots I have. "Prize Crew" was the code name for the Operational Evaluation project that encompassed the QT-2PC's trial in combat. It's an interesting name that harkens back to the swashbuckling era of capturing the enemy for ransom. 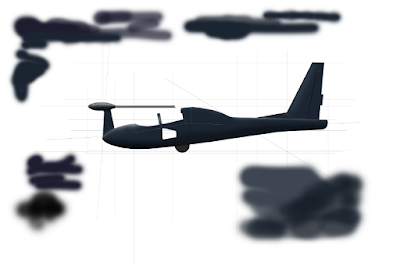 In this case, the Prize Crew team 'captured' civilian-style gliders from a military procurement order and turned them into these spectral birds. Though only two were ever deployed in-country, they logged nearly 600 combat hours, hawking the trails and terrain of South Vietnam, looking for Viet Cong. No fewer than 5 DFCs were awarded to its pilots, too. The Prize Crew mission isn't really new information any more. There are a couple solid sites that you can click on (here, here and here) for great background. So, I won't reinvent the wheel (so to speak). Which gets me back to that Texan who called me up offering me a "storah." Shhh. I think I hear a few comin'... or is that just the wind...? And watch the movie below.